Who Is to Blame for Montreal's Slump? Who Is to Blame for Montreal’s Slump? After a tantalizing start with come from behind wins and scoring a lot of goals, the Montreal Canadiens have come crashing down to earth. This team has been playing sloppy, uninspired hockey where goalie Carey Price has been left out to dry too many times. This year’s version of the Habs is a better team than the one who went the Eastern Conference final last year so this so-called slump they’re in is inexplicable. When hockey teams slump, fans look to the head coach and Michel Therrien has been feeling the heat for some of his decisions. Putting Dale Weise on the top line is bizarre. Sure, Weise was put on the top line for a spark during the Vancouver game and helped the Habs come back and tie the game but one 20 minute performance shouldn’t mean he is suddenly a top line player. This of course is no disrespect to Weise but his talents are best suited for the bottom six. Therrien refuses to split up David Desharnais and Max Pacioretty for whatever reason. They are professional hockey players, they’re not going to cry if they get split up. There is no harm in splitting them up especially with the way this team is playing. Personally, I would love to see Pacioretty and Alex Galchenyuk paired together. Two big bodies, one who can score goals and the other with exceptional hands and playmaking ability, it is ripe with potential. However, the most mind boggling move by Therrien has been leaving Jiri Sekac and Michael Bournival in the press box in favour of Rene Bourque and Travis Moen. Sekac hasn’t played since the Colorado game and oddly enough, the Habs have been slumping since Sekac has been taken out of the lineup. Sekac isn’t a star player but his work ethic and speed were a nice addition to the team and there is no concrete reason why he should be sitting. Recently Kazan of the KHL acquired Sekac’s rights and if Sekac continues to see minimal ice time, what’s stopping him from going back to Europe? It isn’t just Therrien that is feeling the heat in Montreal. Star players have to face the music too and the Habs’ star players are no exception. Price has been more or less back to last year’s form after a bit of a shaky start and has been showing up when the rest of the team hasn’t. And to pose the question most Habs fans are asking is, what is up with PK Subban? Since fighting for his big money deal, he has taken steps back from last year. He’s consistently being caught out of position, getting beat to pucks and his end to end rushes are non-existent. Could it be that Subban is feeling the pressures that come with a big contract? Drew Doughty struggled after signing his deal back in 2011 but rebounded in the playoffs to help Los Angeles win the Stanley Cup. In terms of the risky offensive style that has since disappeared for Subban, could it be the coaching staff putting the reins on him? Subban is at his best when he is playing emotional hockey. During the Boston series in last year’s playoffs, Subban was outstanding for Montreal as he was playing the best hockey of his career. Subban is too talented to play like this for too long so hopefully he gets back on track. Even spectacular saves like these haven’t been enough for Montreal. Price is doing his part. He can’t score goals too. Expectations are as high as they have ever been in Montreal. Since the 1993 Stanley Cup win, the Habs have had some pretty mediocre teams but after last year’s playoffs and the culture change that happened with the hiring of Marc Bergevin, fans have a reason to believe that Montreal can be contenders. This is a good team but I’m not convinced Therrien will be the one to take the Habs all the way. Remember the last time a good team was underachieving with Therrien behind the bench and he got fired? Yep, the Pittsburgh Penguins sacked Therrien and went on to win the Stanley Cup. Coincidentally, Dan Bylsma, the man who replaced Therrien is a free agent coach. 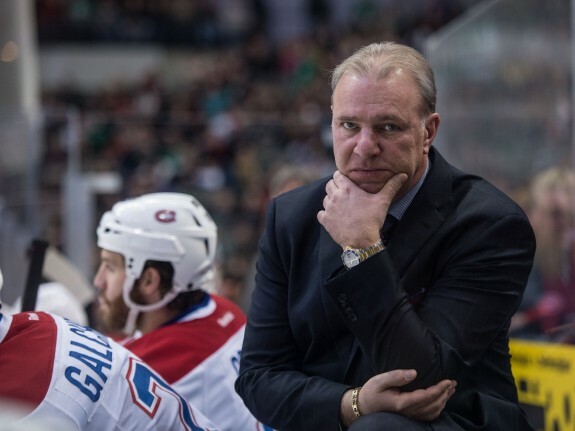 I have no idea if the Habs are unhappy with Therrien but the fans are certainly keeping an eye out for a new coach as Therrien isn’t exactly the most popular guy in Montreal. As per usual, the scapegoat is usually the coach so if Montreal continues to play like they are, perhaps a change is needed.